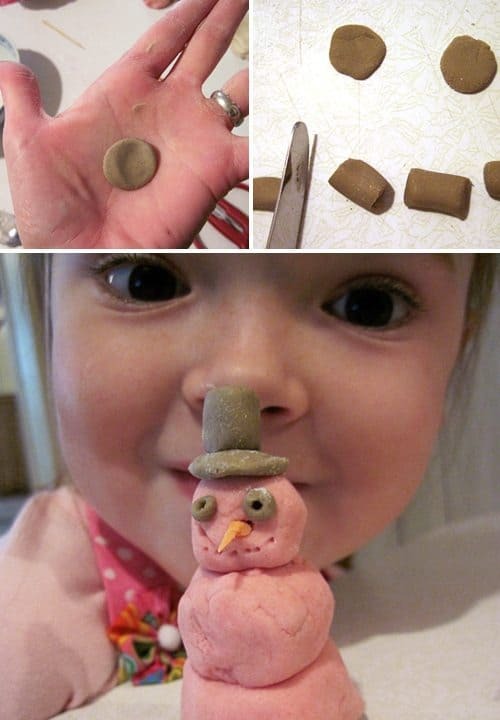 Winter Craft: Snow Dough Men! 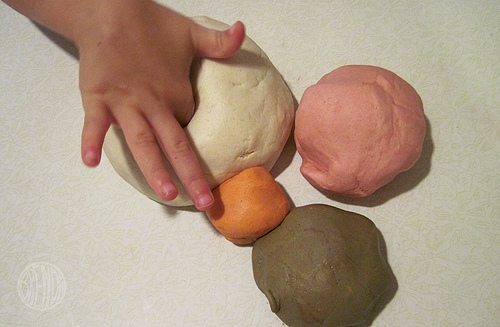 I know homemade play dough has been around probably since flour was invented but I thought since it is such a fun craft for kids, it’s worth featuring one more time here. It’s simple to make, fun to play with and guarantees hours and hours of creativity, especially for kids. We decided to make some fun little roly-poly snowmen. 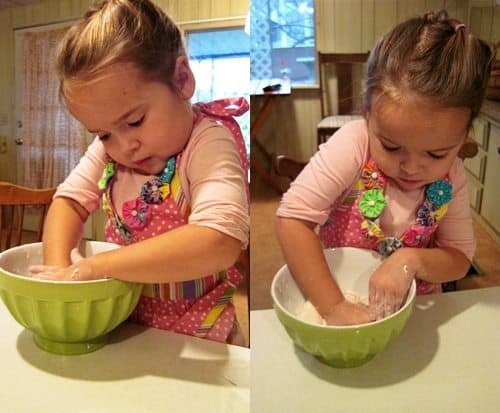 Like most play dough recipes, this one combines salt, water and flour. First, I dissolved 1 cup of salt in 1 1/2 cups of warm water. Then after stirring it for several minutes, we added 3 cups of flour. We kneaded and pounded it until it was nice and smooth. If it’s a little sticky, just add a bit more more flour. Then I separated our dough into four sections. White for snow, pink for my daughter who insists everything should be pink, brown for snowmen hats and eyes, and orange for carrot noses of course! Mixing food coloring into dough can be a bit tricky. Be sure to knead it in a bowl or on a paper towel so you don’t stain your counter top. Your fingers might get dyed a little bit but it does come out eventually. 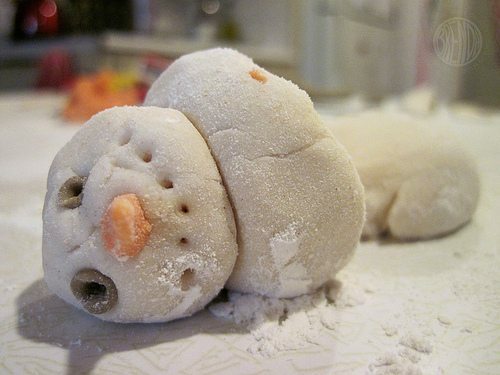 Once our dough was nice and mixed, we started making snowmen parts. 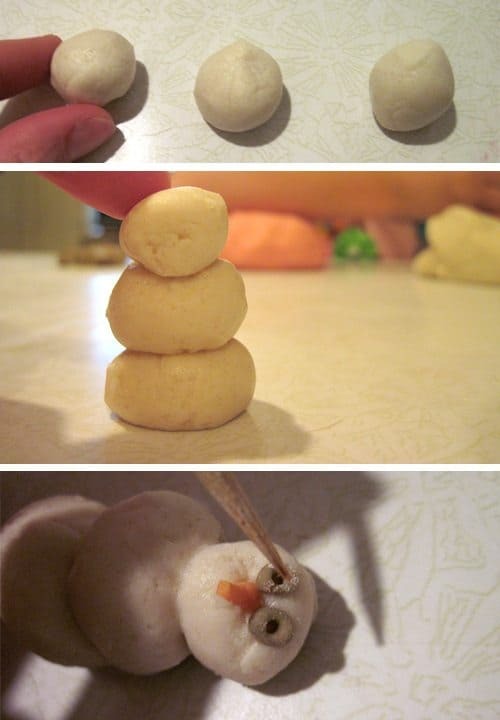 Three round balls made the snowmen’s bodies. (Some of them we inserted toothpicks through to keep them standing up). Little tiny balls made their eyes and toothpicks were invaluable for poking holes and inserting the eyes into their sockets. For carrot noses, we rolled little skinny snake shapes that tapered on the ends. Then we cut them in half and ta-dah! 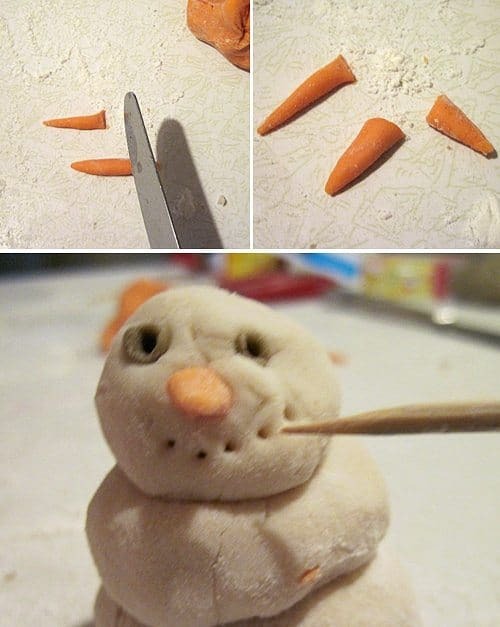 “Carrots!” Then I poked a hole in the snowman’s face and stuck “the carrot” in with a dab of water to act like glue. I also used my handy dandy toothpick to make a snowman smile. For hats I made a bunch of small coin-sized pancake shapes and set them aside. Then I rolled another snake and cut it into short sections for the top of the hat. Then we put them together and topped our snowmen! Of course there were some casualties but isn’t that normal when building snowmen? 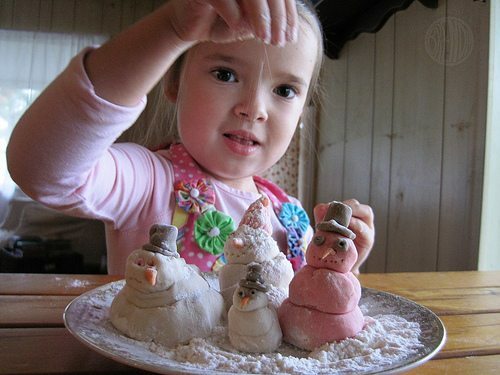 Then my daughter sprinkled on some flour for snow and we called it a wintertime centerpiece! 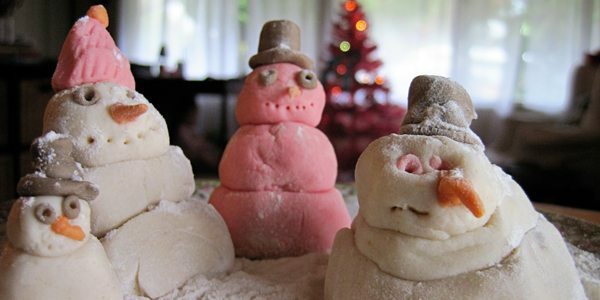 The dough should harden in a few days and who knows, we may keep our little snowmen family around to decorate with next year! Cute! 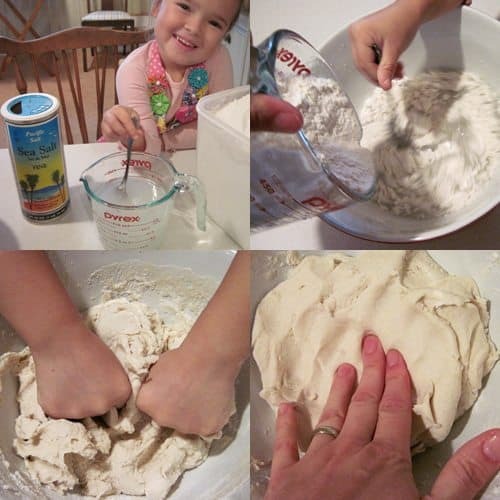 Makes me want to whip up some dough for my tween/teens! Fun fun fun! I love this idea. What a great craft for us to do in January. Especially since my kid won’t be making any real snowmen here in California. Super cute. I really like the added flour at the end. i have wanted to make this for a very lonnnnnnnnnnng time and I’m so happy you posted how to make the dough! I am going to make some of these next year!